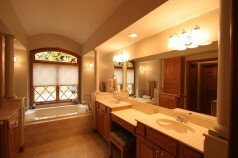 Lee Constantine provided plans and renderings for a master bedroom/bath addition along with the renovation of an existing bath. From the initial discussion with Lee about the master bed/bath addition and existing bath renovation, Lee was extremely professional. The floor plans and renderings for the remodel/addition went beyond my expectations. I was excited to see the effective use of space and the creative design. I couldn’t be more pleased with Constantine Design Group!